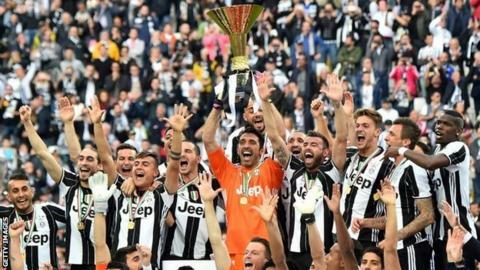 Juventus ended their successful Serie A campaign with a thrashing of Sampdoria before collecting their trophy. The hosts, who have won five Italian league titles in a row, led within five minutes as Patrice Evra headed in. Paulo Dybala scored a penalty - Milan Skriniar being dismissed for the foul on Mario Mandzukic that produced it - and then curled home another. Giorgio Chiellini, on his 400th Juve appearance, added a fourth before Leonardo Bonucci's close-range goal. Juventus have a chance to complete a second domestic double in a row when they face AC Milan in the Coppa Italia final next Saturday at Rome's Stadio Olimpico. Match ends, Juventus 5, Sampdoria 0. Second Half ends, Juventus 5, Sampdoria 0. Corner, Juventus. Conceded by Andrea Ranocchia. Foul by Simone Zaza (Juventus). Andrea Ranocchia (Sampdoria) wins a free kick in the defensive half. Patrice Evra (Juventus) wins a free kick in the defensive half. Foul by Nenad Krsticic (Sampdoria). Attempt blocked. Roberto Soriano (Sampdoria) right footed shot from outside the box is blocked. Assisted by Edgar Barreto. Substitution, Sampdoria. Andrés Ponce replaces Fabio Quagliarella. Goal! Juventus 5, Sampdoria 0. Leonardo Bonucci (Juventus) right footed shot from very close range to the centre of the goal. Assisted by Álvaro Morata following a corner. Attempt missed. Álvaro Morata (Juventus) header from the centre of the box misses to the right. Assisted by Hernanes with a cross following a corner. Corner, Juventus. Conceded by Matías Silvestre. Corner, Sampdoria. Conceded by Giorgio Chiellini. Attempt saved. Paul Pogba (Juventus) right footed shot from outside the box is saved in the bottom right corner. Assisted by Hernanes. Corner, Juventus. Conceded by Modibo Diakité. Offside, Juventus. Hernanes tries a through ball, but Paul Pogba is caught offside. Goal! Juventus 4, Sampdoria 0. Giorgio Chiellini (Juventus) left footed shot from outside the box to the top left corner following a corner. Substitution, Sampdoria. Roberto Soriano replaces Joaquin Correa. Substitution, Juventus. Simone Zaza replaces Mario Mandzukic. Stefano Sturaro (Juventus) is shown the yellow card for a bad foul. Foul by Stefano Sturaro (Juventus). Joaquin Correa (Sampdoria) wins a free kick on the left wing. Corner, Juventus. Conceded by Dodô. Attempt blocked. Stephan Lichtsteiner (Juventus) right footed shot from the right side of the box is blocked. Assisted by Mario Mandzukic. Attempt missed. Fabio Quagliarella (Sampdoria) right footed shot from the right side of the box misses to the right. Assisted by Ricardo Álvarez following a set piece situation. Fabio Quagliarella (Sampdoria) wins a free kick in the attacking half. Attempt missed. Paul Pogba (Juventus) right footed shot from outside the box is close, but misses to the right. Assisted by Patrice Evra. Substitution, Juventus. Stefano Sturaro replaces Roberto Pereyra. Attempt blocked. Hernanes (Juventus) right footed shot from outside the box is blocked. Assisted by Paul Pogba. Attempt missed. Stephan Lichtsteiner (Juventus) right footed shot from the right side of the box misses to the left. Assisted by Paul Pogba. Offside, Juventus. Andrea Barzagli tries a through ball, but Stephan Lichtsteiner is caught offside. Ricardo Álvarez (Sampdoria) wins a free kick in the defensive half. Corner, Sampdoria. Conceded by Leonardo Bonucci. Substitution, Sampdoria. Andrea Ranocchia replaces Jacopo Sala. Attempt saved. Paul Pogba (Juventus) right footed shot from outside the box is saved in the top right corner. Assisted by Andrea Barzagli.